The Pattaya to Hua Hin ferry ( photo below ) departs from Bali Hai Pier, South Pattaya, and arrives at Khao Ta Kiab Pier, Hua Hin every day, weather permitting. The journey time is 2 hours, opposed to a time of 4 hours 16 minutes by road. The Pattaya to Hua Hin ferry at Bali Hai ferry terminal. Pattaya to Hua Hin ferry tickets can be purchased in person at Bali Hai pier or on-line through a booking agent, scroll down the page for details. According to the ferry operator’s website the Pattaya to Hua Hin ferry departs Bali Hai pier ferry terminal ( photo below ) in Pattaya at 13:00 pm and arrives in Hua Hin 2 hours later at 15:00 pm. 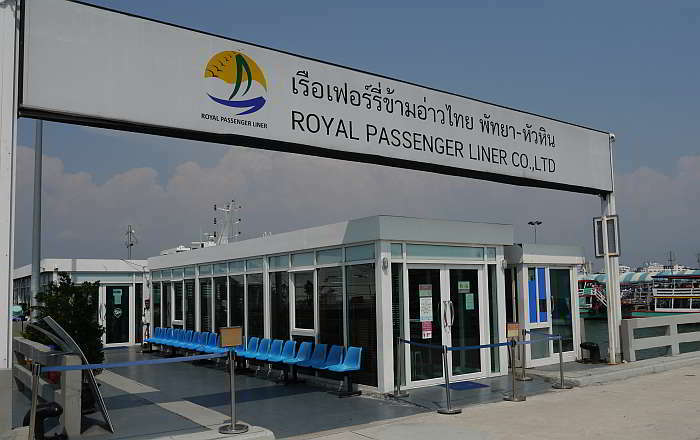 The Pattaya to Hua Hin ferry arrival and departure terminal at Bali Hai Pier, Pattaya. The return journey departs from Khao Ta Kiab Pier, Hua Hin at 16:00 pm, and arrives in Pattaya at 18:00 pm. Buy Pattaya to Hua Hin ferry tickets, or search alternative routes and transport on 12go booking service. Get Pattaya to Hua Hin ferry tickets direct from the ferry operators website. Buy tickets in person in Pattaya: You can buy tickets at least 1 hour in advance, and up to a maximum of 15 days in advance at Pattaya Automatic Parking, 2nd Floor, Bali Hai Pier. That’s the big green building at Bali Hai, the ticket office is located at the end of the building closest to Walking Street. See photos below. Just follow the sign directing you to the ferry ticket office. Buy tickets in person at Hua Hin: Takiab Beach Soi 3, Nongkae, Hua Hin, Prachuap Khiri Khan. VIP rooms for 8 people are quoted at 14,000 baht per room. Please note: If you book with 12go they have optional travel insurance, please make sure the option is not automatically selected if you do not require it. Looking for alternative ways to get to Pattaya? read this guide on getting to Pattaya. Coming from Hua Hin to Pattaya? read this guide about getting around Pattaya. Your first time in Pattaya? read this beginners guide to Pattaya.